Do Practical Effects Even Matter Anymore? To ‘Mad Max’ & ‘Mission: Impossible’… Yes! Granted, a lot of the work was done by stunt performers, but that doesn’t lessen their effectiveness. You can see plenty of examples of that “Edge Arm system” Miller references in the b-roll footage at the bottom of this post (including Hardy strapped to the front of a moving vehicle*), but what I begin to wonder, as Jen Yamato at The Daily Beast notes Miller reminiscing on one scene wherein characters swing in the air from giant poles affixed to moving battle-cars, is just how much practical effects even matter to today’s audiences, engorged on CGI and, most likely, doubting the reality of anything they see anymore. Will audiences even go home asking themselves, “How’d they pull that off?” In the case of the sequence mentioned above, after months of failure leading to the thought it may have to be done digitally, stunt coordinator Guy Norris and his team (which included as many as 150 stunt performers at once) hit pay dirt with a system that included poles reaching as high as 30 feet, that were counter-weighted with an engine block at the base, positioned at the fulcrum point, which could be adjusted for different performers and moves. 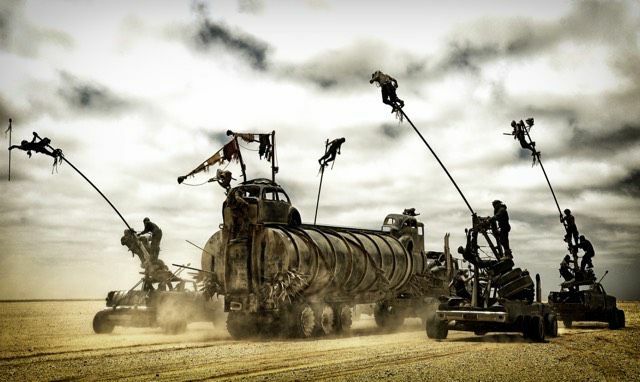 The device allowed the Polecats to glide through the air by coordinating their moves with the stunt team positioned on the vehicle, pushing and pulling the weighted block for leverage. Those Polecats, by the way, were assembled by Cirque du Soleil performer Stephen Bland. Will that matter to you while you’re watching? Will the reality sink in and make for a more visceral experience? Then we come to another summer release, Mission: Impossible – Rogue Nation, of which we already know features a scene with Tom Cruise as Ethan Hunt hanging from the outside of a flying Airbus A400M Atlas during takeoff and landing, at times reaching heights of 5,000 feet in the air. Today a second stunt was revealed that sounds just as nerve-jangling and knowing what we know now, may even be more amazing once we see it in theaters. We also have filmmakers such as J.J. Abrams who reportedly has added as many practical effects to Star Wars: Episode VII – The Force Awakens as he can. The film will obviously be loaded with CGI, but those little touches of practical effects can go a long way when it comes to adding a sense of realism to a story of fantasy, especially one so loaded with other-worldly and imaginary beings as Star Wars. But, again, I go back to wondering just how much this matters. I wonder if audiences will even notice or even care to notice. Will they search for “How did they do the underwater scene in Mission: Impossible 5?” after seeing it, or will they assume there was some measure of trickery involved and move on with a “ho hum”? This isn’t to blame audiences, we’ve been conditioned to assume everything is a visual effect, everything is a digital creation and even when the effects almost appear photo realistic we’re bombarded with stories about how wonderful the effects are, a la Dawn of the Planet of the Apes and Avatar. As real as they may appear, it’s reinforced before we ever see a single frame that, no, this isn’t real, it’s fake. It’s almost backward in its thinking.